heinnews’s David Hein was at Game One of the German Beko BBL Finals between Brose Baskets Bamberg and ratiopharm ulm. And Hein couldn’t overlook top German talent Paul Zipser in the press row next to fellow prospect Mauricio Marin. Hein and Zipser talked about the up-coming U18 European Championship, his decision about a club for next season and what factors are important in that move. 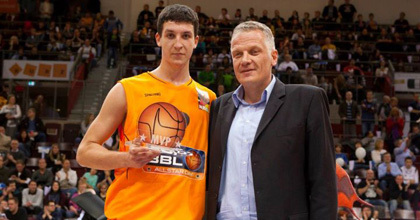 The fact that Zipser is in Bamberg comes less than a week after the German mass daily Bild said Bayern Munich were after the talented forward. heinnews: We are a few weeks before the U18 Euros, how things are going with the preparations for the tournament? Zipser: The conditioning camp starts in two days and that will go for 10 days. But I cannot be there because I have my final exams for school. There will be a lot of work there but I will make it up when I’m back in Heidelberg. But I am not sure when the final training camps are. heinnews: Germany were drawn into a tough group with Serbia, Spain and Ukraine. What do you think about Germany’s chances in the group? Zipser: I think we will be strong. Of course we have the toughest group with Serbia and Spain. But I think we can win one of those games. We could be second, maybe even first in the group. heinnews: And what are the team goals for the tournament? Zipser: We haven’t really come together to formulate a goal for the tournament yet. heinnews: You are here at the Beko BBL Finals in Bamberg. Could that mean you will be playing here next season? Zipser: I will decide in the next one or two weeks. heinnews: Are there other clubs in question? Zipser: I have looked at a couple of clubs just like here. I enjoyed some more than others. Then I will sit down and try to make the correct decision for myself. heinnews: What factors will be important for you in your decision? Zipser: I really want the practice to help me develop. I am not looking to win anything in particular. It would be nice. But next year I just want to improve as much as I can and get the best training possible. heinnews: What are your goals for next season? Zipser: I want to realize my potential and get the best out of myself that I can.